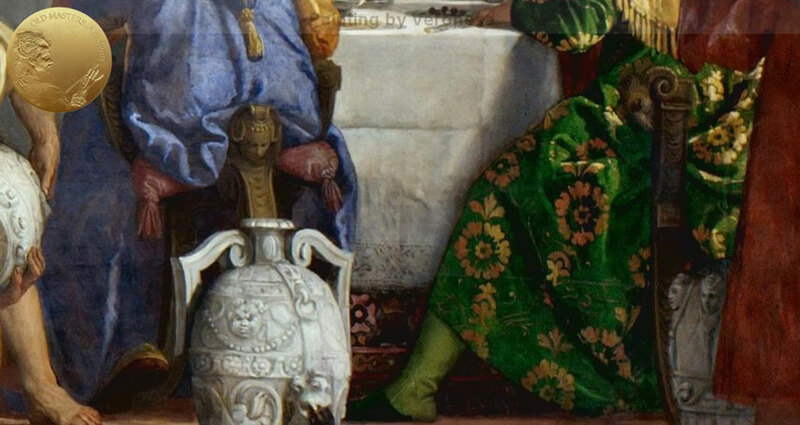 Titian, contrary to his younger colleague and competitor Veronese, wasn’t particularly into the color green for his draperies. So, we will pay attention to the depiction of greenery in his paintings rather direct our focus on green draperies. 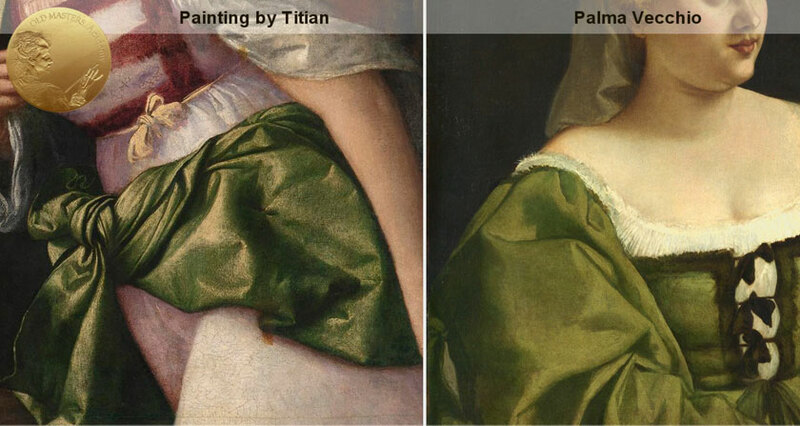 When painting vegetation, the structure of paint layers – the colors used for the greenery mixes – is very similar to how Titian’s contemporaries depicted vegetation. 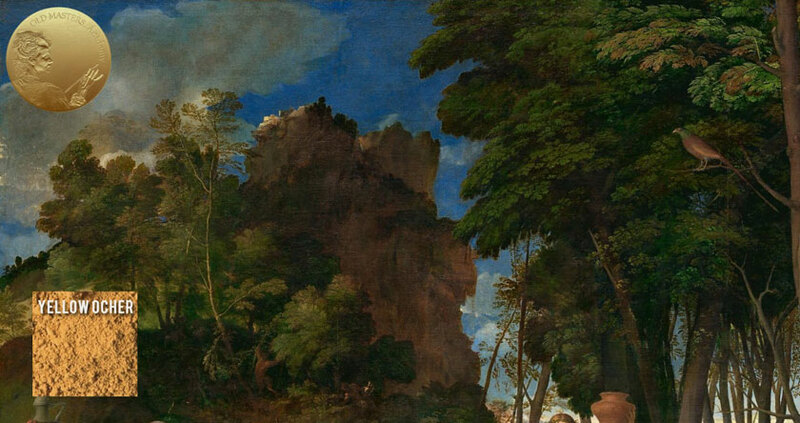 We can compare this fragment of Titian’s depiction of greenery with Giovanni Bellini, Cima, or other painters. The most used pigments used for foliage mix included earth colors like: yellow earth, red earth, verdigris, and lead-tin yellow. Small amounts of other pigments could also be present. 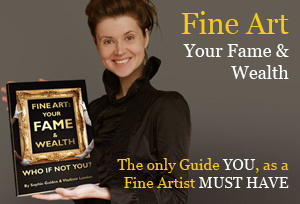 The oil used for the glazes was stand linseed oil. The sequence of the paint layers is as follows: First of all, a brown under-modelling, usually containing red earth in addition to yellow earth, was laid down; then, the sequence of green layers by various darkness were applied. Light green highlights were applied during the final stage over the most illuminated areas. In The Appearance of Christ, almost all the green tints, containing verdigris with yellow pigments, are still intense and deep. There is some discoloration of green on the tree behind Christ. This faded foliage was painted with different shades of a brownish paint that wasn’t a strong green in the beginning. This area contains yellow and red earths, some verdigris, indigo, and lead-tin yellow. The top part of the canopy was painted with verdigris, lead-tin yellow, and white. To achieve the appearance of depth, Titian first painted the tree with semi-translucent yellow-brown tints of yellow earth. This layer gives an impression of a discolored green glaze. Individual leaves were painted on top, so the brownish under-layer is still visible, giving an effect of the light shining through. The foliage in the shadow was painted with a more opaque brown, consisting of red and yellow earths. The addition of verdigris and indigo gives a greenish tint to the brown paint. Bright green was only used for the foremost leaves. This green was made of a mixture of verdigris, yellow earth, and a little lead-tin yellow and lead white. And the brightest yellow greens were made of the lead-tin yellow and a little verdigris and yellow earth. The green landscape in the foreground of The Holy Family (with a Shepherd) has well preserved colors. 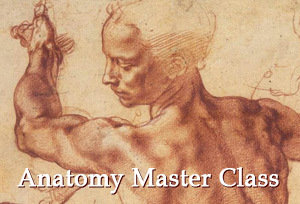 It was painted using conventional technique. The grass in painted with mixtures of verdigris, lead-tin yellow, yellow earth and lead white. The trees’ foliage appears to be olive-green and brown. There may be some discoloration of green; however, the examination of the sample suggests that brownish tints were originally intended and were painted with semi-translucent yellow-brown earth, and a little lead-tin yellow and lead white. Bacchus and Ariadne – There is a great variety of green and brown shades in the trees, although some greens might have faded a bit. The tree in the upper right corner was painted with yellow and red-brown earth pigments, mixed with a small amount of verdigris and lead-tin yellow. The use of yellow pigment suggests that Titian wanted that tree to be autumnal. The small trees behind Bacchus are special as they were painted with an unusual mix of verdigris with expensive ultramarine and a little lead white and lead-tin yellow. The foreground plants have rich greens that were probably built up with layers of verdigris with lead-tin yellow and white. The green plants and foliage were painted over a transparent brown underpainting, which we can see is not fully overlapped. The foliage in The Aldobrandini Madonna also has a big diversity of green and brown shades. 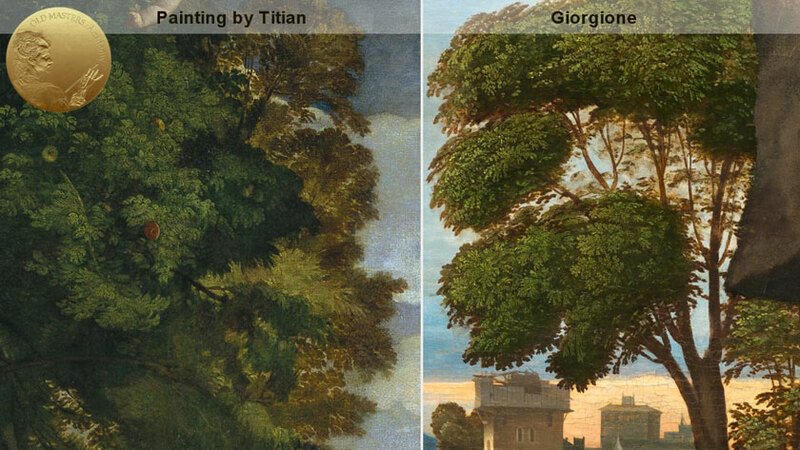 These trees are painted with the most attention in Titian’s career. As before, the brown color of the trees is the artist’s palette choice, not a result of discoloration. The sample shows that the green leaf was painted in yellow earth and verdigris, with the addition of a little lead white and red earth. It was then overpainted in a brighter green verdigris, lead-tin yellow, and lead white. The sample cross-section from the tree above Saint John’s cross shows that underpainting was intentionally brown, done in red and yellow earth with almost no verdigris. On top of this brown underpainting, Titian applied several layers of different shades of verdigris green mixed with earth pigments, lead-tin yellow, and lead white. The very top thin layer contains some red earth and therefore is brownish yet again. And finally, we will look at a very beautiful green drapery with yellow highlights from Tititan’s early painting Christ and the Adulteress. 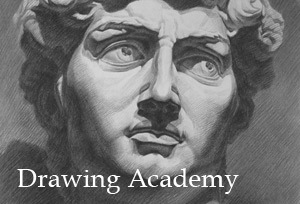 His way of painting green draperies is very similar to green draperies from paintings by Cima and Palma Vecchio. The cross-section of the sample from the green drapery contains several layers of verdigris and lead-tin yellow mixed with copper green glazes.